The Paulick Report has an article today that suggests it is possible that the Kentucky Derby field size could be limited going forward. As longtime readers of this blog now, this is a subject I like to kick around on a semi-annual basis and think that it has a lot more merit than one of the other ideas suggested in the wake of the Eight Belles situation – that of barring fillies from running against colts, which not only makes no sense from a safety perspective but further separates American racing from its international counterparts. I first wondered why we have a twenty-horse field in 2006; at that time I considered that while the large field could lead to safety concerns, to my mind the larger issue is determining whether all those horses deserve to be there; it’s no fun to watch a bunch of sprinters who have no business being in a mile-and-a-quarter race impeding a horse with a legitimate chance. 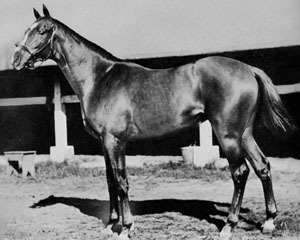 This year, I examined the history of the twenty-horse field and noted that it is a comparatively recent phenomenon (even in 1985, only thirteen horses made the cut, and in the 1990s fields were often large, but not necessarily hitting the twenty-mark). In that respect, it’s hardly an august tradition worth protecting, nor does maintaining it force the underlying issue – who really should get a ticket to the big dance? While I would be thrilled if making the field smaller added to the safety of all competitors, I would also very much appreciate the dialogue that one hopes would be generated by bringing such a size limit into force. I don’t think that relying on graded earnings is a terrible way to make those decisions, but as I’ve argued before, the formula could use some refinement. I’m not convinced a horse with no wins (or at least respectable finishes) at 3 but a bumper bankroll from his (or her) 2-year-old year is what we should be encouraging to line up on the first Saturday in May. By the same token, a horse who is suddenly coming into his own just around Derby day but who doesn’t have the earnings is, at present, often locked out. You can argue that is entirely fair – if the horse had a weak foundation, there was probably a reason for that – but you might be losing a hype horse who could bring in fans and television viewers. Assembling a panel to choose ‘wildcard’ entries has its own potential pitfalls (even at the most basic ‘assembling the panel’ stage), but it could be worth considering. As a general rule of thumb I tend to assume about half the field doesn’t deserve to be there come Derby Day – especially when it’s as large as twenty horses. If limiting the field size marks a return to more traditional paths to the race (and sparks discussion over how to choose the final field), I’m all in favor of the move. Perhaps a point system, weighted towards three year old starts at a mile and over. Two year old form receives half the points of a similar three year old start. (160 for a 3yo win and 80 for a 2yo) or whatever. Points or 3-year-old graded earnings would be a better system than the current lifetime graded earnings list, and restricting the field to 14 would probably lead to a more genuinely competitive race. Too many connections seem to go for the experience, forgetting the horse. From a handicapping perspective, I wouldn’t mind limiting the field although I don’t know how else you would ever get a horse like Street Sense at 7-2 or Curlin at even higher odds. And there is something to be said of the spectacle of all those horses thundering down the stretch entering the club house turn. Big Brown only ran in 1 graded stakes race, The Florida Derby, prior to the KY Derby. There are many Graded prep races for 3 year olds leading up to the Derby. Perhaps a win and you’re in system similar to what they use for the Breeders Cup would be useful in conjunction with lifetime earnings. In this way, 3 year olds that weren’t so hot or only had 1 race as a 2 year old would be eligible and some of the better horses as 2 year olds would still have a shot at the roses if they can carry that early form into the 3rd year.